This decision will reverberate far beyond the individual case. For over 25 years, the Americans with Disabilities Act (ADA) has been read to exclude transgender people from the scope of its protections. When this foundational civil rights law was passed in 1989, a specific exclusion for transgender people was written into the law because of the prejudice of some members of Congress at the time. GLAD knows stigma when we see it. We know that the way to attack stigma is to take it on directly, not to retreat from it. Kate Lynn Blatt, a transgender woman who was mistreated and eventually fired by her employer, Cabela’s, stepped up to challenge that exclusion by asserting her right to bring a claim under the ADA. GLAD was proud to support Kate Lynn’s efforts with a brief laying out the argument for why such an exclusion cannot be allowed to stand. We advocate for transgender people under disability laws because such laws are designed to ensure that people capable of contributing to society are not prevented from doing so because of misunderstandings and bias against medical conditions. For transgender people who suffer from gender dysphoria, disability laws – including the ADA – can, should, and must provide important protections. GLAD has been at the forefront in advocating for disability protections for decades. In 1998, AIDS Law Project Director, Ben Klein, argued and won the first ADA case to be heard by the Supreme Court. GLAD understands the importance of fighting against the discrimination people with stigmatized medical conditions experience – whether based on HIV/AIDS status, Hepatitis C, lipodystrophy or gender dysphoria. Last night a federal district court in Pennsylvania agreed. This is a huge step forward for the transgender community. 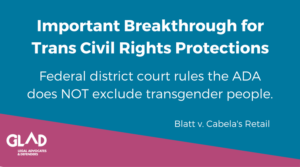 In this monumental ruling, a federal court said – for the very first time – that transgender people are not categorically barred from seeking relief from discrimination under the ADA. First, that being transgender is not itself a medical condition. Second, the Court acknowledged that some transgender people experience gender dysphoria – clinically significant distress associated with the experience of being transgender. And because gender dysphoria remains a stigmatized medical condition, there is no principled justification for barring transgender people from the protections of the ADA. There is no principled justification for barring transgender people from the protections of the ADA. This is a huge step forward for the transgender community. It lays a foundation for transgender people to pursue broad civil rights protections across a range of areas – including employment and public accommodations – and sets the stage for legal challenges to discriminatory laws and private activity that target all transgender people, including those who experience gender dysphoria and those who do not. This decision will reverberate far beyond Kate Lynn’s individual case.